craft fair season is over, but i've been making gifts! out of other music's top 25 releases of 2007, i own one: st. vincent - marry me. i know z has band of horses - cease to begin and maybe the spoon record. you know what though? i don't feel like i am missing that much. i used to worship other music for being the end all be all of music taste. my top list is going to be less crazy than last year because although i've been listening to stuff, a lot of it has been over and over again. i feel a bit older. listening to old things and nostalgic albums a lot more than new stuff. though there is definitely new stuff that gripped me in 2007, it is a lot less than in previous years. i have had a headache for two days straight now. tonight zachary and i went to see our pal kris racer play at schuba's with a full band. walking through the bar was hell. i hate smoke. so much. i cannot wait until the smoking ban goes into effect. we stopped in at jewel to pick up some more OJ for me who is now the sicky boo. 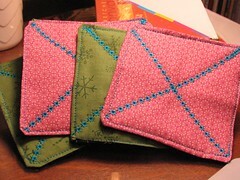 then i came back and sewed some coasters for a co-worker's birthday. i had already bought her a gift for xmas and i'd forgotten her bday was next week, so i figured i'd make her something. she loves christmas stuff so i used snowflake fabric and then two other fabrics and voila. they are not perfect, but i think they are pretty good for a first try. in the middle i used wool felt. the zipper was an experience since i just winged it and i didn't take out the zipper foot becaue i couldn't remember where it was, so...it still works, but it would have been better. i think alex will still like it. also, miss alison says she will give me a zipper tutorial, so i will wait until then to try adding another zipper to one of these. here are the photos i had made into postcards. i'll sell them in sets of three. limited to 100 sets. w00t. 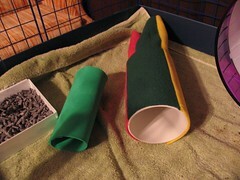 also, monday night i sewed a thing to go around his pvc pipe to make it a bit more interesting for him. he pooped and peed in his other tunnel thing and it will have to be hand washed which i haven't had the time or energy to do, so i figured this was a quick solution. he likes it! 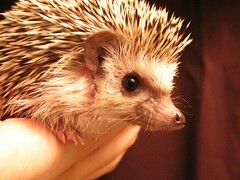 Hoggle is such a cutiepie! 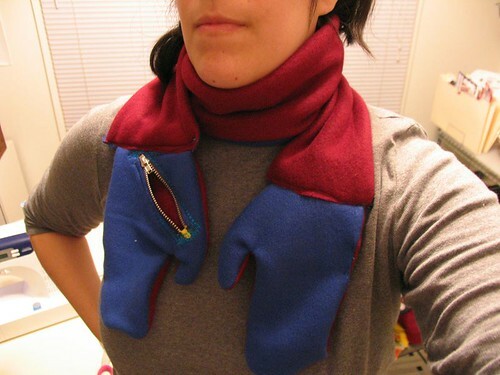 OMG that scarf is so rad! And I love the coasters! being in the northwest where no one smokes anywhere, it is hard for me to believe there are places out there that still allow inside smoking! didn't the ban pass in chicago, like, forever ago? i thought it was about to happen before i moved a year and a half ago! guess not... anyway, i feel your pain. smoke drives me crazy and makes me feel awful. 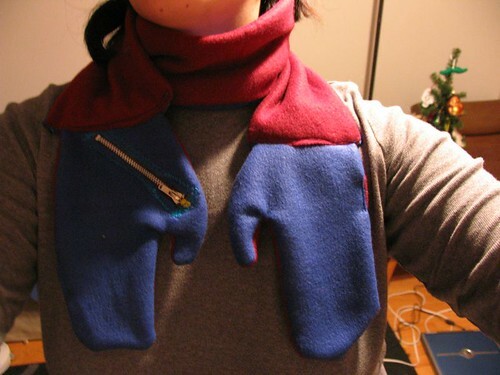 good job on your new sewing projects. i can't wait to get past christmas when things calm down at work & i can FINALLY learn how. 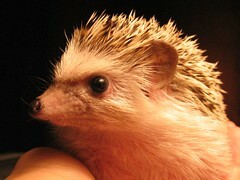 that hedgehog is the most redonkulous animal of all time. i want to give him the snorggling of a lifetime. 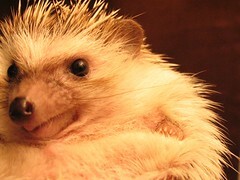 those pics need to be sent to cuteoverload as well. That first paragraph regarding music, yep. I checked and I only have 3 of their top-25. Mostly I think that means that my tastes are pedestrian and MOR, which used to bother me, but I likes what I likes, so whatevs. But I just got the last Jason Anderson record - Tonight - in the mail last night and I thought of you. I listened to it right before drifting off to sleep. Lots of woahs! I don't know Alex, but I do know that somebody is getting a superawesome Xmas gift! Nice work! I, too, am super excited about the smoking ban going into effect. No more burny eyes and stinky clothes after a night out! i am slowly learning my sewing machine. i am really excited about it. i'd love to be one of those ladies who can quilt. quilts are awesome. then i could make a t-shirt quilt! I am ashamed to say that I received a (mini) sewing machine as a gift years ago but never really learned to use it. Maybe that should be a New Year's resolution this year. A t-shirt quilt would be awesome! I am sending these in to cuteoverload!